Summer is the perfect time to introduce kids to gardening. But if you don’t yet have the time or space to care for your own garden, don’t fret; there are plenty of gardening apps for kids to turn to. The latest to crop up is Gro Flowers, a new app from eco-minded developer Gro Play. Aimed at kids ages 2-6, it’s a game where kids get to become gardeners and maybe learn a bit about biodiversity along the way. 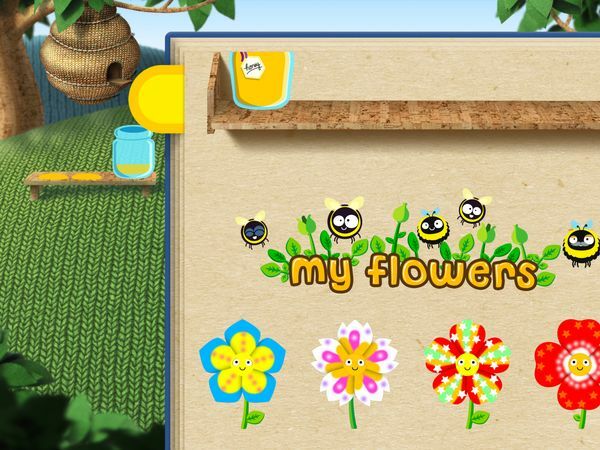 In Gro Flowers, kids can create their own flower species. They simply chose a color and a brush, then paint on the given template. As they draw on a petal, the pattern will be automatically repeated on the other petals in a kaleidoscope effect. The finished flower will appear in the field, where bees can be seen buzzing about. Kids are then tasked to guide the bees to collect nectar. New blossoms will spring from the ground as the bees move from flower to flower, introducing the concept of pollination. When a bee has collected enough nectar, it will reward kids with new colors and brushes to play with. Additionally, it will return to its hive to produce honey. Kids catch the drips of honey in a jar, and once full it will be placed in the storage. As more flowers appear, so do other pollinators: butterflies and hummingbirds. Kids must also watch out for bug sprays that appear randomly; if not tapped, it will drive the pollinators away. One thing to note is that the field can only contain so many flowers. When the maximum number of flowers is reached, a rainbow will appear in the sky. Kids can choose to preserve the field that way, or start over with new flowers. The app automatically saves every flower design in the collection book, which can be accessed any time by tapping on the small yellow tab on the right side of the screen. The app offers more than 70 colors and 50 brushes, so kids can create a wide variety of designs. Gro Flowers is a stress-free app where kids can express their creativity any way they want. It has neither timer nor scoring system. It doesn’t include written instructions, making it accessible to younger kids. Safety-wise, there is nothing to worry about as the app doesn’t contain ads or in-app purchases. There is a link to the developer’s site on the main page, but it is protected by a tap-and-hold mechanism. Gro Flowers is a simple app with great educational value. Instead of feeding kids with fact sheets, it chooses to let kids learn as they play. Kids also get to discover their creative side as they design various flowers to plant in their garden. Bright and colorful, the app easily appeals to kids. The little animation and sound effects are adorable. I especially like how the flower will fall asleep and snore if kids spend a long time drawing. You can also tap on each flower in the garden to hear them sing a note. Gro Flowers is a simple and creative way to teach kids about biodiversity. As kids grow their garden, they learn how bees and butterflies help with pollination in exchange for nectar. They can also collect new colors and brushes to create unique flower species. A suitable app for ages 2–6.